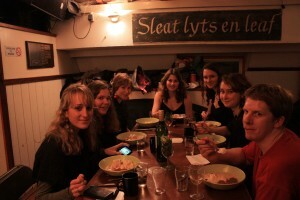 This month the Local of the Month is granted to AEGEE-Utrecht. Being a big local with 340 members requires a lot of responsibility and attention and still AEGEE-Utrecht managed to focus on both organising a Pre-Agora event together with AEGEE-Amsterdam and the final Where Does Europe End (WDEE) conference while also managing events in connection with the celebration of their 25th anniversary. One of the most difficult city names to pronounce in AEGEE is this month’s Local of the month. Utrecht is the fourth-biggest city of the Netherlands with little more than 300.000 inhabitants, and one out of five inhabitants is a student. Utrecht is known for her Dom Tower in the city center which you can always see because of the law that no building can be higher than this tower. If you visit this city close to Amsterdam you can find canals looking similar to those in the Dutch capital, and another thing that the city can be proud of is that these days they are able to follow two of their “hometown boys” compete in the EURO 2012 on the Dutch national team: Sneijder and Affelay. One last notable thing about this Dutch city is that it is known for its train station, which is the node in the Dutch railway network. Having so many members gives AEGEE-Utrecht the liberty of providing many different areas of interest for their antenna. Alongside their board of five members, AEGEE-Utrecht has about 30 different committees among which anything from a cooking committee to a New Year’s Eve committee, to a magazine commitee, to an introduction committee and much more. As if that was not enough they also have Working Groups and sororities, fraternities and mentor groups. Being a board member for AEGEE-Utrecht is a full-time job asking from the five board members to dedicate all of their time, which is quite handy because they have about two AEGEE activities a week: social drinks on their boat every Wednesday and another activity another night of the week. How did the work go when you were organising so many different things? How do you cope with that? Marleen Dijkhoff (President of AEGEE-Utrecht): Well, as mentioned we have a lot of committees and that is the reason for us to have managed. They have been working really hard to organise everything and they also had a lot of help from other AEGEE-Utrecht members for instance with lodging pre-event participants or helping with baking pancakes for the conference participants. We are really thankful that we have so many different members and that they all love to put their effort in for anything but AEGEE. Now that you have organised such big events, are you then “relaxing” or do you have more big events planned for the near future? Marleen: Well this period is a little cool down period from big events for us, but we still have all our local events. For instance, last week we went to Brussels and we have a hitchhiking competition coming up. But this summer we will be back with our Summer University ‘Discover the Dutch way’. Our plans for next year are not set yet but we are definitely going to have an exchange with AEGEE-Ankara. What has been organised in connection with the celebration of your 25th anniversary? Jelle Bauar (President of AEGEE-Utrecht’s 25th anniversary committe): Various activities have been organised around a central theme: ‘Beyond Borders: AEGEE verlegt je grenzen!’ In September 2011 we published the agendas with the anniversary logo upfront for free for all people of interest. We had a “sexchange” party (with gender switching) at the beginning of the year to warm things up and expand some borders for some people with about 100 party animals. We launched our anniversary website in the beginning of this year, had a children’s party at the weekly social drink to bring back childhood experiences and cross the borders of your memory with games and candy. Then we went on our anniversary trip visiting AEGEE-Beograd and AEGEE-Sarajevo for eight days with 20 participants. Furthermore, we had participants collecting money for “Médicins sans Frontières” (Doctors Withour Borders) in competitive and cutting-edge games in April alongside handing out anniversary promo material including passport covers and stickers that same month. 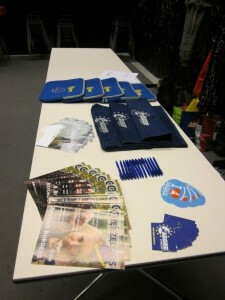 As if that was not enough we have also been selling official merchandise with the anniversary logo to AEGEE members including sweaters, towels, laptopcovers, bathing wraps, beerglasses, and organised an anniversary gala in Fort Vechten in an old fortress with about 100 pariticipants the 17th of May 2012. – On Sunday & Monday: “mystery weekend”, where 20 participants went surfing in Hoek van Holland and enjoyed the good weather at the beach and on the campsite; we have been working on an Anniversary Book which is scheduled to be published at the end of August, including stories and pictures of the last five years of AEGEE-Utrecht and especially the last year with all these amazing activities. Jelle: It has been an amazing experience. We started as a team already in February 2011. It is very special to be working together for such a long time and really get AEGEE members excited to celebrate our 25th anniversary. Especially with the help of active support of some local Working Groups, for example the one organising the WDEE Conference and another for the Gala in May 2012. A Working Group supporting us with the anniversary book is still working hard to finish this amazing book. We managed to strike a healthy balance between parties and content-related activities. Every member had the chance to take part in their favourite activity and had a really good time. As organisers it was sometimes difficult to do the maximum effort and still do some studying next to that. We had to change the team somewhat during the year. For the better, though, because we managed to reach our goals and set AEGEE-Utrecht on fire! As a local we have made some valuable contacts with AEGEE-Beograd, AEGEE-Sarajevo and Médicins sans Frontières. Altogether it has been a wonderful year and we hope to welcome you all sometime in Utrecht! Why did you choose to organise the WDEE conference? Casper Wolf (President of WDEE conference committee): Our former president Sarah Zandvliet was a participant at a WDEE event which took place in Leon in November 2010. When the project team was looking for a partner to organise the final conference of the WDEE project, around AGORA Alicante, Juan Sordo (then project manager of the WDEE project) was in contact with Sarah and the option of organising the final conference in Utrecht was first discussed. It was finally agreed on in a later stage. Apart from Sarah’s personal involvement, an extra reason was the 25th birthday of AEGEE-Utrecht this year. By organising this conference we wanted to show the network that our local could organise such an important and content-heavy event as well as develop the skills of our local members. Did it put any pressure on you to organise the final conference of such a popular project? Casper: We focused on our work and we were willing to make this final conference count. We did not focus on the impact of the whole project for the Network. How did working with the WDEE team go? Casper: Cooperation between an international team and a local team can be difficult. Our great advantage was that I, as a former member of the WDEE project team was part of our local team. I knew the project team members very well and I was regularly in contact with them to coordinate tasks and share information. 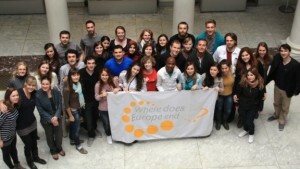 AEGEE-Utrecht applied, in cooperation with Kasia from the project team, for Youth in Action at the national agency. After we received the grant, we worked on getting other funds, getting speakers, arranging logistics, coordinating with the project team on the workshops they would give, contact with participants, etc. The project team was in charge of getting the participants and the content of the event, apart from getting speakers, which we were better able to get here in the Netherlands. And on the other hand, how was it to work with the organisers from AEGEE-Utrecht of the final WDEE conference? Juan Sordo (Where Does Europe End): Amazing. 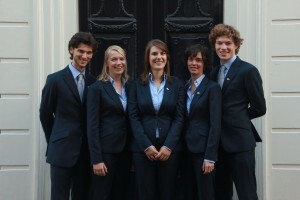 They were one of the most professional teams I’ve ever worked with in AEGEE. From the beginning until the very end they had control of everything, even the last minute things. We agreed that they would take part in the content part as well, since it was one of their motivations, and they did a great job with it. They managed to get amazing speakers and wonderful places to hold the workshops and lectures. It was very nice to have news from them every other day telling us how it was going with the preparations of the event. Percin Imrek (Where Does Europe End): Working with the organisation team from Utrecht was one of the most smooth working experience in my life. They were a great combination of being disciplined, but also relaxed when needed. They were always helpful and did not mind our last minute requests, and did their best to achieve those. They were very much prepared and very friendly, both with us and with the participants. You can see that because most of the organisers won awards during the ‘Oscar’ ceremony of the event, and because they were all fantastic, all of them were chosen at the same time for the category of ‘Best organiser’, along with a nice flashmob prepared by the participants. How did the organisation of the WDEE conference go? Casper: We were very well prepared at the beginning of the week, but we were unsure about how things would go when the event got in full gear. We soon experienced that everything went fine. The participants were great, we had speakers of high quality and the workshops given by the project team were interesting. We had a full programm, in which speakers, group sessions and social activities alternated. There was a good group atmosphere and little went wrong. By the end of the week, the participants and the organizers learned a lot and we gathered enough input from speakers and participants for the final booklet. Juan Sordo: To be honest, I believe it was the best AEGEE event that I’ve ever been to. I know this is the typical thing you say, but trying to be as objective as possible, even though it was the last WDEE event (many emotions for the core team) the atmosphere was great in there. Very interesting speakers, amazing and hard-working participants, everything very well organised (Dutch style, always controlling if we were one minute late) and great parties and dinners thanks to the subteam of AEGEE-Utrecht. After the event I’ve received some emails saying how great everything was and how grateful the participants were for coming, and apart from a Summer University where this is more obvious since it’s more party-style and last for two weeks creating more bonds between participants and organisers. Percin Imrek: We had many participants in Utrecht that attended our previous events, and they all agreed that this was ‘the best event of WDEE’. I agree with that as well, because this event was a great combination of good organisations, interesting speakers, well-prepared sessions, fun energizers and motivated participants. Therefore, I am more than happy that this event happened in Utrecht with these fantastic people, and therefore, I know that the local of the month is a well-deserved award for AEGEE-Utrecht. The AEGEEan wishes congratulations to AEGEE-Utrecht both with their 25th anniversary and being the local of the month! ← Their name is Kastoria, contact Kastoria!